The idea of a Chair with its many meanings, is currently under attack by artists, designers, fabric and textiles designers. Sitting down it seems, is loaded with meaning. Rooms, halls, gardens, subways, train stations; all places we need to be seated. Sitting is a human experience…common to everyone. Why not re-think it? 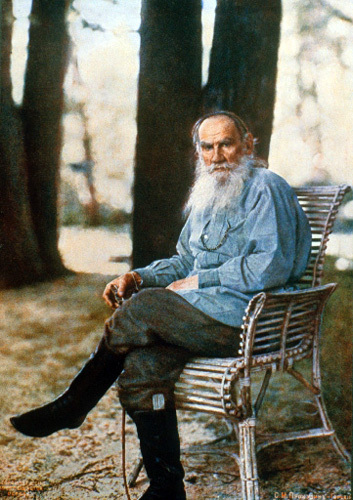 This image of Tolstoy (an extraordinary moment captured on film) seated in his own garden at home tells a powerful story about him. 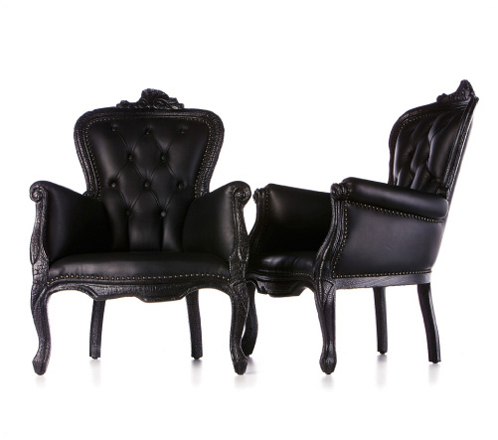 The European chairs, shown here are a Bergere Style that has long been considered cliche. Yet, when presented in a luxurious leather and their distinct frames painted to make them disappear, they tell a different story. A chair as an object, instantly tells the story like a great brand. Picture an entirely empty space in your mind: it can be dominated by the mere selection of a set of chairs that can tell a story or a table, for that matter. Great brands and their meaning are based on a good story that is often a common experience to everyone; a powerful visual is part of that story and this is why we are so attached to our ideas about chairs, in fact. Common human experiences such as sitting in chairs, suddenly can become more interesting just by the combination of choices we make to express them. A chair, like a brand, when placed in a backdrop that is part of this story, speaks to us. Listening becomes the other element of an interesting brand story.